Author’s Note: I met Paul Plumeri in 1971 when he was a high school guitar prodigy. Now, 30 years later I caught up to him to discuss his brilliant career and what his plans are for the future. The veteran NJ blues guitarist and singer has a new band and a new live CD in the works. He tells of the successes of his first CD, Bishop Of The Blues and the plans for his sophomore effort, Live In Seattle, in the following interview with Musicians Realm ~Tom Yanno. Paul feels that the trio concept has helped develop his distinctive style of guitar playing with lots of beautiful chords mixed in with his superb licks. “I’ve always loved chords. There are so many beautiful cords, you never get to know a tenth of them. They do the trick in fill-in. My rhythm is heavily evolved by R&B and the soul thing and jazz. When you combine that with the rock power cords you have an amalgamation that turns out to be what I do. It is amazing how many good guitarists can play a good lead but leave the entire rhythm out completely,” Plumeri told Musicians Realm. 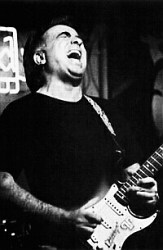 Anyone who has had the pleasure of taking in a live Paul Plumeri Blues Band performance will be especially enthusiastic about the approaching release of Live In Seattle. “The live album is getting some artwork finishing touches and is 99% done. It should be ready to go hopefully pre-released by the end of the year and have them for sale around the holiday season.” As with The Bishop of the Blues, Live In Seattle will be an independent release. “I had a very good crowd and a good line-up out there. The Seattle crowd is very much involved in a diverse music scene. (The blues circuit) is not like in the Trenton area where the venues are almost exactly the same as they were thirty years ago. Seattle has tons of places. Blues is more the norm than the exception,” Paul said. Paul’s theatrical agent uncle, Don Palmer, gave him a start listening to “Wes Montgomery and Arthur Prysock and that kind of sound and I’d hear Jimmy McGriff and those bluesy cords and the whole shuffle thing had a lot to do with the jazz side of me. In the summer between my junior and senior years in HS I teamed up with (Trenton area bassist extraordinaire) Gregory Simon who turned me on to a lot of blues and I caught the vintage guitar bug from him.” (See Paul’s interview in Vintage Guitar magazine). Paul was heavily influenced by among others, Jimi Hendrix, Eric Clapton and Pete Townsend. A clear Mike Bloomfield influence can be found in Paul’s unique style. “As much as we admired Mike Bloomfield thirty years ago, he’s virtually forgotten now. These young kids don’t even know who he was and it’s a damn shame. He could hold ground with Clapton any day,” Paul said. Paul’s fans can watch for the release of Live In Seattle on the Paul Plumeri Blues Band web site. If you have not heard him live, it is well worth a trip to the Central NJ or Bucks County PA areas to take in one of his shows. You can check out his gig schedule as well on his web site and order Bishop of the Blues which is a great investment at $15 U.S. and $18 outside. Both prices include shipping. Tom Yanno, yanno.tom@att.net for Musicians Realm, September, 2001.